I palæ, som var den tidligere hotel af de første generaler i kavaleri School i Saumur: Lejlighed / duplex 300 kvadratmeter, 8 værelser, rolig, solrige, i hjertet af Saumur, sine restauranter og butikker, med en luksus præmie i et miljø der kombinerer genstande og møbler fra det sekstende til det tyvende århundrede. 5 soveværelser, mezzanin-lounge på over 100 kvadratmeter. 5 indendørs pejse giver incomensurable charme til de forskellige dele. Skyline synspunkter gamle Saumur, Loire og Chateau. Et af de højeste punkter i den gamle Saumur giver enestående udsigt i gamle Saumur. Charmen af ​​historie. Bygningen var hotel kommandoen over de første generaler i kavaleriet skole. Enestående komfort: elevator, aircondition, 4 badeværelser og> 4 toiletter. Independence rum for unik komfort og tillader alle at finde den intime rum. Central bygning til gåture, shopping, cafeer, restauranter. For mere information, billeder kontakte ejeren. Den udsigt, historie og komfort er virkelig de kriterier, der gør den merværdi af lejligheden: en af ​​de højeste punkter i den gamle Saumur. Charmen af ​​en historisk by, med komforten i et centrum med mange restauranter, caféer og handel gør denne duplex fodfæste mere end behagelig. Hvis børn, antallet af sportslige aktiviteter til rådighed i Saumur. Lær om internettet eller ejer. Cykelstier gør meget aktiv by for cykel elskere. Tres bon emplacement géographique. 2 appartements atypiques au caractère historique. Nous avons passé un tres bon reveillon. Le seul bémol : petite cuisine avec peu de rangement. Gilles, Was a gracious host. He was restoring another building behind this one and was always ready to answer any questions we had.The apartment is very big with 5 bedrooms that can sleep up to11 people. It has vewiews of the Loire river and the Chateau and is close to the center of Saumur. Lots of things to do in Saumur and the Loire valley. A lot of stairs but there is an elevator. We spent 9 days and had a good time ! I am very happy that the property fit your expectations. Double appartement situé sur les quais de la Loire, avec vue sur le château. L'appartement est situé au sommet de l'immeuble (avec petit ascenseur) avec de superbes vues. Il comprend en fait deux logements complets. Décoré de meubles anciens, et de tapisserie, on se croirait chez un antiquaire ! De plus, la dame qui s'occupe de l'intendance est toujours souriante et prête à vous aider. - la qualité du lieu : beaucoup de charme, une vue à 360° à couper le souffle (notamment sur les illuminations du château la nuit), de l'espace (nous étions 8 personnes et le nombre des chambres et des salles d'eau/wc permet un confort et une intimité qui ont été très appréciés), des feux de cheminée ! et l'accès par l'ascenseur. - la facilité de stationnement et la proximité du centre ville. Notre séjour a été tout à fait à la hauteur de nos attentes, et nous recommandons chaleureusement ce lieu à tous les amateurs de "beaux endroits" chargés d'histoire. Our visit had a bit of a rocky start as the housekeeper was not ready for us. After answering the door buzzer, she said she’d be down tout de suite, but left us waiting on the street for at least ten minutes, if not longer. However, after that less than smooth beginnng the rest of our visit was very nice. The duplex is huge and three of us girlfriends were quite comfortable. It is an excellent location for exploring the Loire Valley. A fine boulangerie is a few doors down and lots of restaurants are close by. The view from the lounge is indeed of the castle and is lovely at night. This is not an apartment to which I would bring children. Lots of hard, uneven surfaces and beams to knock one’s head on. It would also be difficult to keep curious hands away from the numerous antiques. Parking can be a challenge but the restrictions on the paid lot right outside can be worked around with one’s day trips and outings. I can definitely recommend this for your next visit to the region. Thank you for taking care to appreciate. About children: certainly they would have to be respectful of antiques of mainly more than 400 years old. This is perhaps difficult. However it is good for children to have the smell of history. Sports is part of education. Understanding the past is too full of learnings. I am so sorry you hurt the beams. It remains nevertheless a lot of space ( more than 90% ) between 3 meters and 5 meters of heigth without beams. We loved this 'boutique' apartment. The interior is amazing - the artefacts which adorn the apartment make it feel unique and there is a real sense of history to the place which seems fitting when you are looking up at the beautiful Saumur Chateau. The full length windows mean that you have a sense of the outdoors and it was lovely to have so many plants around, which is unusual in a holiday rental. We found Gilles a very kind and attentive host and it was great to see him out and about around Saumur too! 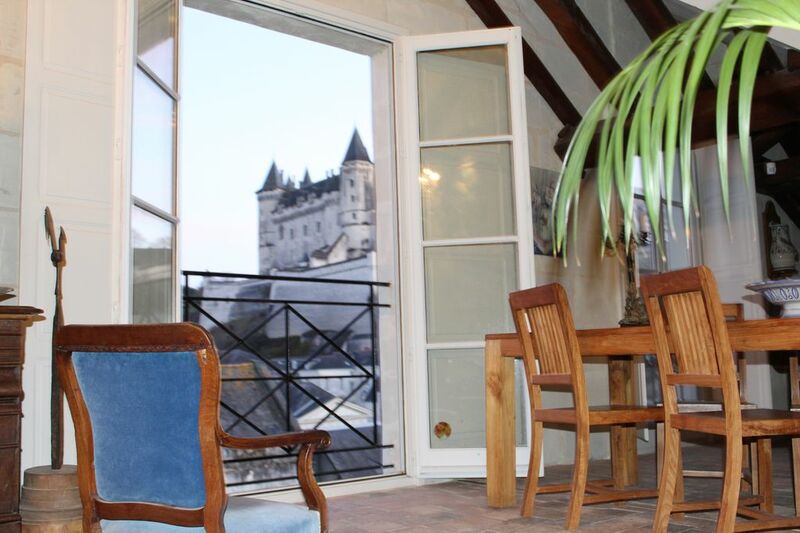 Saumur is a wonderful town - and the location of the apartment means that you are right at the centre of city and riverside life. It is extremely handy for bike hire and also not too far away from kayak rental. We will definitely stay here again when we return to Saumur.